I never really expect too much on an early August bird walk. Fall migration hasn’t quite arrived. The birding can be a little slow. But I’m rethinking that after a walk last month produced two very unexpected birds. The first was a pine siskin, a “winter finch” that our group might have overlooked if not for some goldfinches feeding in a patch of coneflowers. The bright yellow birds led us to the brownish, streaky one. Finding a siskin here in August is no easy task. An even bigger surprise came later that morning. Look, up high on those bare branches. What is it? Some kind of flycatcher, judging by its size, shape and posture. But what kind? At times like this, birding in a group pays dividends. We all began studying the bird, and fortunately it gave us plenty of time. 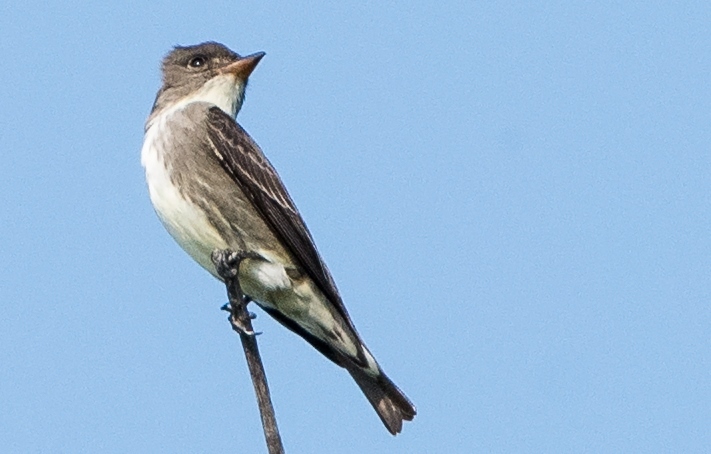 Several times it sallied out to capture flying insects, returning to its original perch—classic flycatcher behavior. There was never a doubt about what family this bird belonged to. The next five minutes were exciting, framed by a sense that we were seeing something special. Initial speculation pointed to olive-sided flycatcher. Apps were opened, field guides consulted, and photos taken as the birders shared their collective knowledge about flycatchers. It’s a fun but challenging process that doesn’t occur on every bird walk. Great care is taken to get it right. We all agreed it was indeed an olive-sided flycatcher, a new species for Cantigny Park (No. 153) and a notable bird for any DuPage County location. I personally had not seen one in seven years! Our quarry was not a “rare” bird, just an uncommon one that apparently began its southern migration quite early. And as ID challenges go, this wasn’t extreme. On a scale of 1 to 10, with 10 being the most difficult, the olive-sided flycatcher was maybe a 6 or 7. For more expert birders, perhaps a 2 or 3. Accurate identifications depend on many things. Birding experience counts for plenty, and so does familiarity with the particular species. Light conditions, distance from the bird and the amount of time the bird presents itself also come into play. Greg Neise, one of Chicago’s top birders, wrote a wonderful essay last spring called “Birding is hard,” posting it on the American Birding Association blog. Putting names to birds is tricky business, Neise wrote, and even highly skilled birders occasionally get stumped. In fact, sometimes the bird “wins” and we must let it remain unidentified. Other times we get it wrong and don’t realize it until a few minutes later, the next day or even years down the road. To borrow an old Chicago Cubs marketing slogan, It’s Gonna Happen. Yes, birding is hard. The more we do it, the more we discover how little we really know. You could learn the songs of 25 common birds, a nice accomplishment. But do you also know their chip notes? Well, the good news is that you don’t have to. Birding can be enjoyed on many levels. It’s truly as challenging as you care to make it. We go at our own speed. If you seek them, the tough IDs are out there waiting—the gulls, shorebirds, flycatchers and of course the fall-plumage warblers that are with us now. Stick with it and you might come to relish such opportunities. Birding is hard, but in a good way. So if you are just getting started, don’t be discouraged. Most of the time, birding is pretty easy. Otherwise it wouldn’t be so popular. Organized walks are good, and there are lots of friendly people ready to help you see and identify the birds. The DuPage Birding Club offers a full slate, and check out the “FullersBird Fridays” series conducted by the Forest Preserve District of DuPage County. You could also hang a feeder or two in the backyard and let the parade come to you. That’s birding too, and it’s easy. This month you could stand outside just before dusk, look up, and see common nighthawks cruising by. Easy. Later this fall, listen for flocks of migrating sandhill cranes when you’re out raking leaves. Easy, and a must-have for any yard list! Indeed, maybe the easiest thing of all about birdwatching is that you can do it almost anywhere at any time—for two minutes or two hours. I really can’t imagine a day without watching or listening to a bird. Hey, have you noticed? Birds, all kinds of birds, are around us. Have fun, be curious and expect surprises. The learning part comes naturally. Copyright 2015 by Jeff Reiter. All rights reserved.